This shield kit pack will allow you to turn any Arduino into an AVR chip burner! It is specifically designed for people who want to program Atmega328P's to turn them into Arduino bootloader chips using an AVR-ISP sketch, but it can also be used to make a 'standalone' AVR ISP programmer - so that you can program blank chips without a computer! We use this set up in the shop to program chips for our kits. 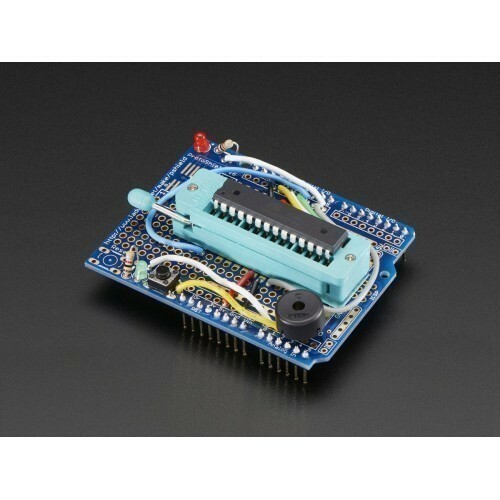 We even include a blank ATmega328P DIP chipso you can get to programming immediately! Blank ATmega328P chip - ready for you to mess around with, program, and reprogram! You'll also need some solid core wire for the connections, soldering tools and basic hand tools. An Arduino is not included, you'll need one to plug the shield into, and a USB cable to program it as well.